Mothers and Daughters. Is there something you wish you knew about your mother, but for some reason hesitate to ask? Author P.J. Cloud makes the it easy to open a mother and daughter dialogue. Ms. 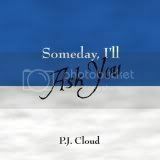 Cloud has written a lovely book that will become a mother's personal journal for her daughter and granddaughter as well. If you are curious about your mother's past but uncertain how to broach the subject, or if she does not like to talk about her childhood, Someday, I'll Ask You, can help you get past the hurdle of uncertainty. Ms. Cloud has chosen an apt title for her book. When was your mother born? Tell me about the place she grew up, is the first question is this 81 page journal that is ready for entries. Some questions, however simple are not easily asked or are easily answered. This book can help a mother revisit her life's journey and possibly learn more about herself as she answers uncomplicated but meaningful questions. Someday, I'll Ask You, can help a daughter better understand her mom and perhaps learn why she loves a certain song or what her dreams were long before she became mom. Have you ever wondered why you love to paint? enjoy ballet, theater, etc., but your mother seemingly has no interest in the arts? Her response to the question, What would you have done different in your life if you hadn't married? may surprise you. Sometimes parents put dreams away when children come. This book is a chance for a daughter to get to know and appreciate mom on a different level, as a person rather than a parent. Someday, I'll Ask You is divided into several sections, The Early Years, The Teenage Years, Young Adult, through You're A Grandma and beyond. If you are thinking, my mother would never do this, she doesn't like to write. Buy the book anyway and use it as a bonding tool. You can ask the questions and record her answers for yourself and for her. The author suggests that this is a book that can be completed and re-gifted without guilt, I agree with her. And, what a treasure. This book is available from Amazon below.